Matthew Mitcham is a Golden God. DAMN STRAIGHT, girlfriend can tumble. 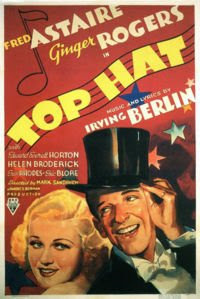 Yay for Top Hat! One of the most random and fun film titles ever. I finally got going again with my "list" viewings (I'm getting way behind); both this and Singin' in the Rain were playing free at school (on actual film, or so it seemed) this past weekend. What a fun double feature! I made a point of seeing this one first, since I knew Singin' would top it easily (no pun intended). Anyway... mistaken identity, romance, singing, dancing (tap dancing in a hotel room to be specific), and lots of Ginger Rogers to be ogled. By golly, she sure is pretty. I had no idea. I also had no idea Fred Astaire had such a weirdly triangular face... I guess I imagined him as more classically handsome. He is a great dancer, though. A bit of trivia: there was apparently an oscar for "best dance direction" back in the day, since it's one of the four this film was up for. Best pic is another, as is best song for "Cheek to Cheek", an Irving Berlin original. I actually knew the "Cheek to Cheek" sequence already (from the immortal Purple Rose of Cairo) but didn't know it came from this particular film. That was a fun bonus. All in all, a very cute depression-era charmer, with a timeless musical sequence in "Cheek to Cheek". It has an elegant simplicity and sense of purity (despite numerous continuity errors). Worth checking out, even if it's not on your list of 200 required classic films.